Illuminating Britain's Armed Forces charity sector through unique evidence, extensive knowledge and insightful analysis. Forces in Mind Trust (FiMT) and the Directory of Social Change’s (DSC) report Focus On: Armed Forces Charities’ Education and Employment Provision, reveals that a small number of charities provide a much-needed range of educational and employment services to 35,800 people in the Armed Forces Community. Funded by the Forces in Mind Trust (FiMT), this report is the second of six Focus On reports from DSC which provide more detailed information on armed forces charities’ support for key areas of need. Figures presented in the report illustrate that a large need is being met by a relatively small number of charities. Armed forces charities supported at least 22,302 individuals into employment and helped over 3,300 individuals gain qualifications in the past year, most commonly for veterans and their dependants. The analysis shows that 78 charities provide education support, which represents 6.5% of all UK armed forces charities. Of these charities, 59 also make provision for employment. 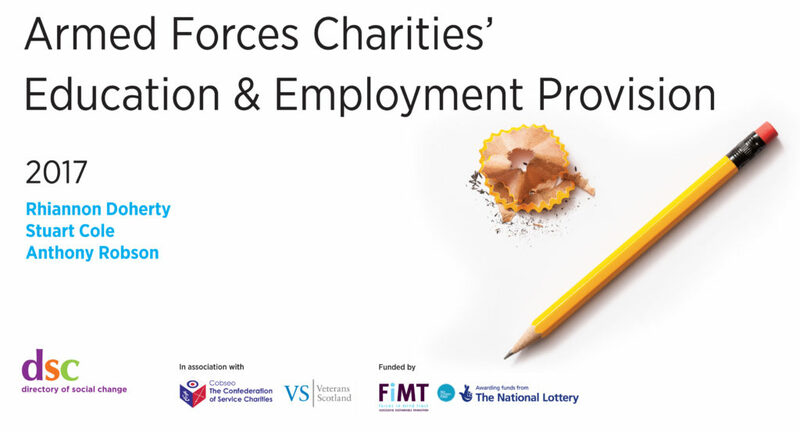 In total, armed force charities spend around £25.6m on education and employment, serving at least 35,800 beneficiaries from the armed forces community. Educational and employment services covered in the report include: vocational courses; academic qualifications; work opportunities; and mentoring such as CV writing and job searches. Direct grants to individuals and organisations are explored, along with partnerships and collaborations between charities and businesses. The report highlights specialist primary provider charities and shows depth of provision, which can have a dramatic and positive effect on an individual’s chance of successful transition to civilian life.